The beginning of 2015 marked the launch of the new and improved porcelain-coated Pit Barrel Cooker. 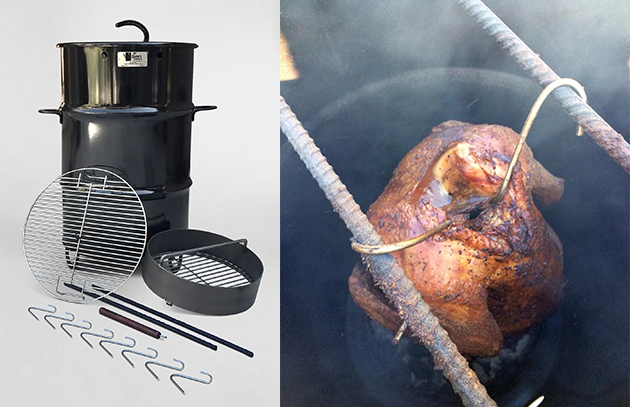 We’re giving away this updated, versatile Pit Barrel Cooker kit to one lucky winner. Enter below for a chance to win. The Pit Barrel Cooker kit comes with a 30-gallon steel drum, stainless steel hooks, steel hanging rods, a charcoal basket, a grill grate, a wooden hook remover, and a horseshoe barrel stand. NO PURCHASE NECESSARY. Open to US residents of the 50 states and Canada, age 18 years as of January 31, 2015. Sweepstakes begins at 12:01 a.m. Eastern Time (ET) on 1/27/2015 and ends at 11:59 p.m. ET on 2/10/2015. For official rules, click here. Void where prohibited. Learn more about the Pit Barrel Cooker.